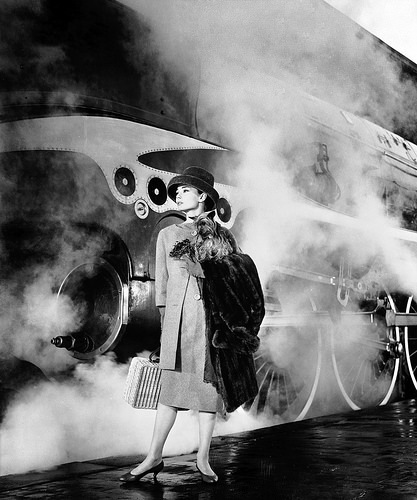 For as long as I can remember I have adored Audrey Hepburn. Even before watching Breakfast at Tiffany’s for the first time, I was drawn to her timeless beauty and grace and watching her films only made me admire her more. Whether playing Eliza Doolittle in My Fair Lady, Sister Luke in The Nun’s Story or Regina Lambert in Charade she brings such elegance and intrigue to every character. I love how expressive her face is, those famous eyebrows, her glistening eyes and magnificent bone structure…she would have made a marvellous actress in the silent movie era! A trained ballet dancer she moves with ease across the screen and brings style to every role, whether dancing in Funny Face, singing in Breakfast at Tiffany’s or playing a runaway Princess in Roman Holiday! Not only was Audrey Hepburn a true Hollywood Star, she was an incredibly talented woman and spoke English, Dutch, French, Spanish, German and Italian! She had that true star quality but also the ‘common touch’ in the sense that people could relate to her in all she had been through both on screen and in her, at times rather tragic, private life. Towards the end of her life, Audrey dedicated a lot of her time and energy to being a UNICEF Goodwill ambassador and helping impoverished children across the world. She travelled to many countries including Somalia, Ethiopia, Turkey and central America on UNICEF missions and whilst she must have found it completely devastating to see such sadness across the world, she was very passionate about her humanitarian work and if you have seen any images of her on these trips, you can see how personal it was for her. “Often the kids had flies all over them, but she would just go hug them. I had never seen that. Other people had a certain amount of hesitation, but she would just grab them. Children would just come up to hold her hand, touch her – she was like the Pied Piper.” (John Isaac – UN photographer). This star quality that I have talked about and the ‘Audrey Hepburn Allure’, is still ever present and is bringing large crowds to the current Audrey Hepburn Portaits of an Icon exhibition at the National Portrait Gallery, running until the 18th October. 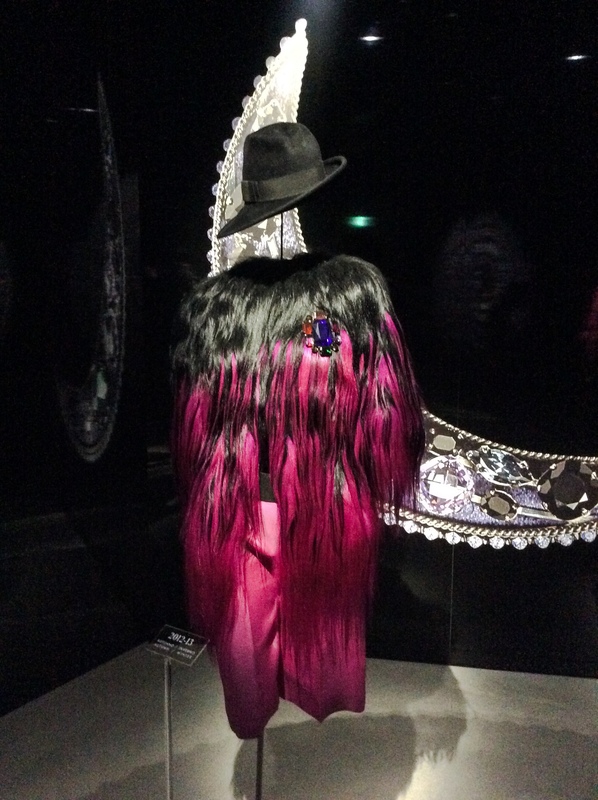 I first heard about the exhibition before Christmas and was so excited to see it! My Dad and I booked train tickets to London on Wednesday but stupidly didn’t check first we could get tickets to see the exhibition, then found they weren’t available on-line or via telephone! But after a sprint across London to the Gallery we managed to get in without problems…panic over! I was surprised by the size of the collection of portraits and a little disappointed that there weren’t more photos from her private life (as the exhibition was curated with collaboration from her family), however it was still highly enjoyable and had some beautiful images, including movie stills, magazine covers and backstage photos. I am very grateful we managed to get tickets and that I didn’t miss my opportunity to see her – we had just finished, when someone set off the fire alarm and we all had to be evacuated! Never a dull moment! 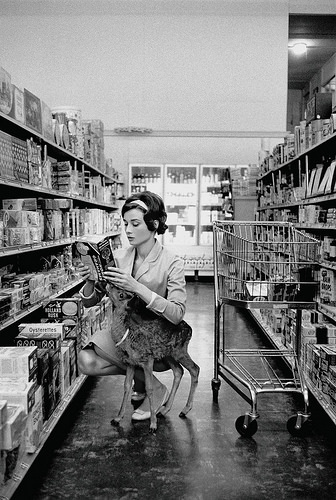 This was one of my favourite images from the exhibition, Audrey with her fawn shopping for groceries…as you do! Have you been to the exhibition? What did you think? 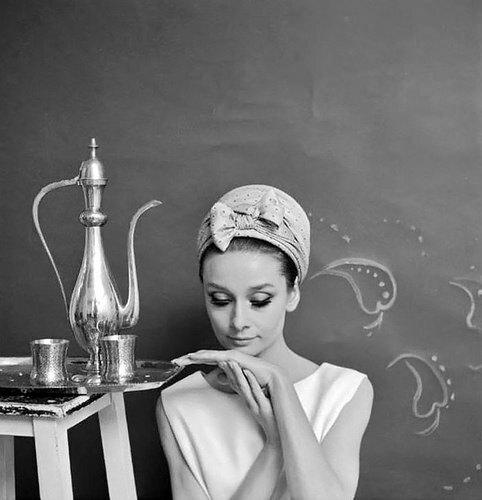 What do you admire about Audrey? Personally I admire her modesty, her wonderful child like sense of fun and her compassion for other people…I can’t think how to describe it better, but she really does have an allure, a magical, star quality. 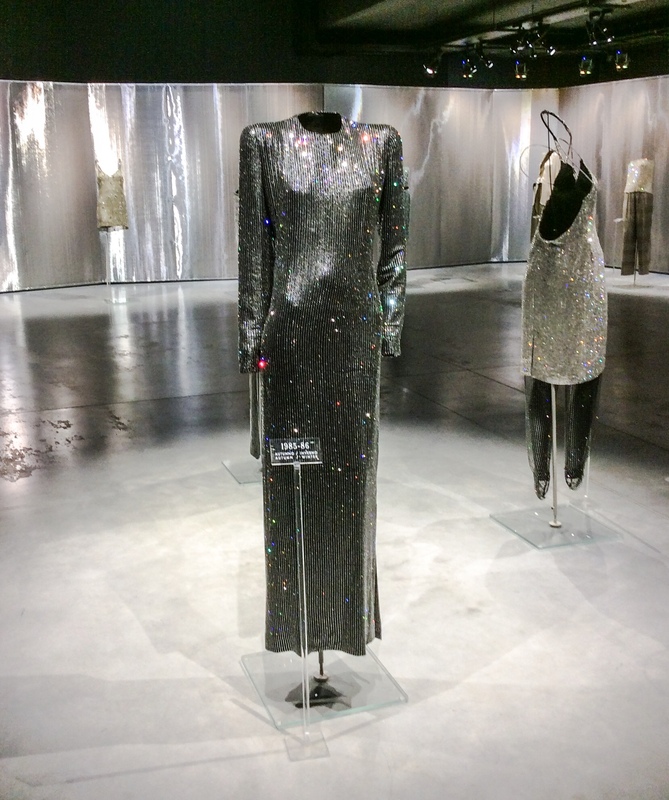 As I mentioned in my recent post on the wonderful Prada Foundation in Milan, the same weekend I also visited the Armani Silos. 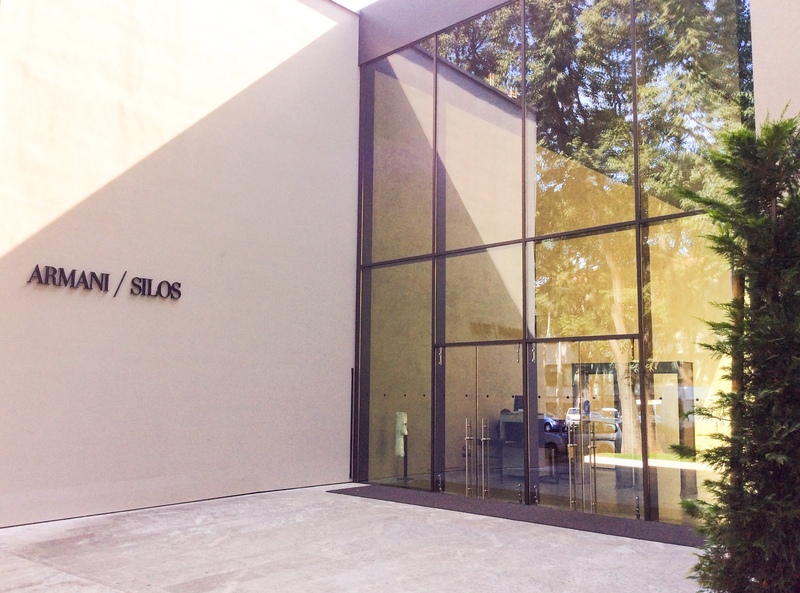 The building was originally used for food storage, hence the name ‘Silos’ and Giorgio Armani decided to maintain the name, as he explained that for him, fashion is as essential to life as food! 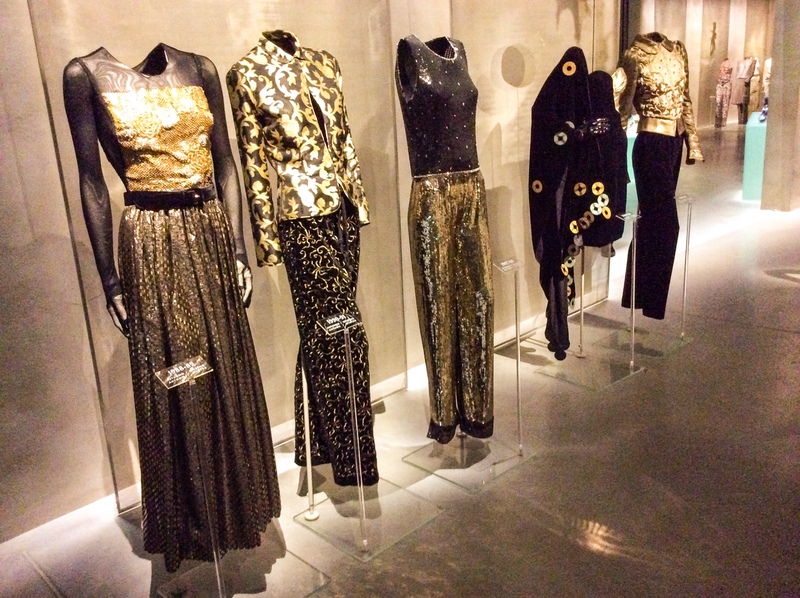 The large space of 4500 square metres is spread out over four floors and the collection exhibits clothes from the 1980’s to today, as well as a digital archive on the top floor. 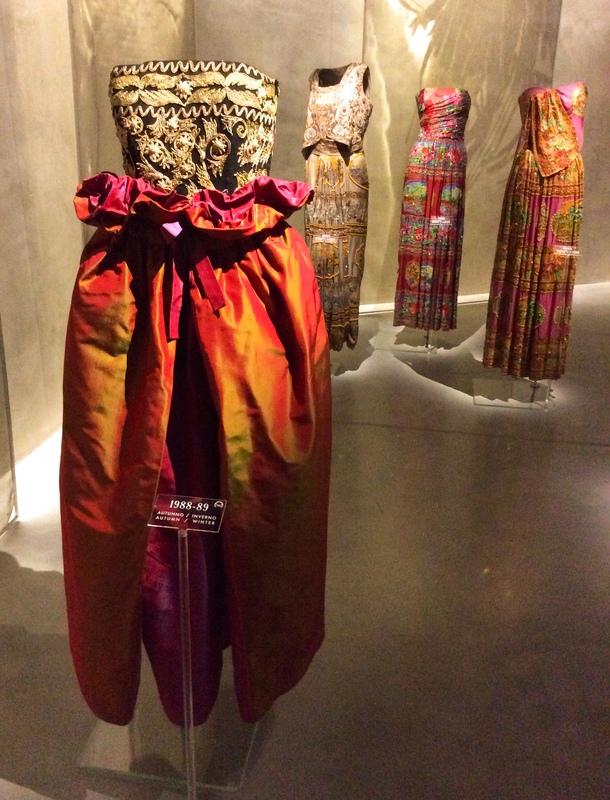 The clothes are organised in themes and you start with the Stars and Day-wear section on the first floor, moving upwards to Exoticism, Colour-Schemes and finish with Light and the Digital Archives on the fourth floor. What I really liked about this layout was that it meant you could see how Armani has been influenced by certain things again and again throughout his career. 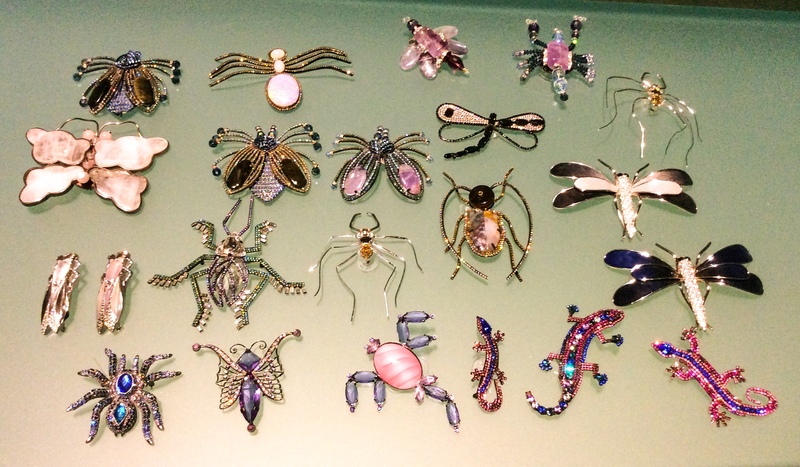 They had grouped together pieces, for example from the 80’s and 2000’s which featured similar exotic fabrics and colours, insects and intricate beading. 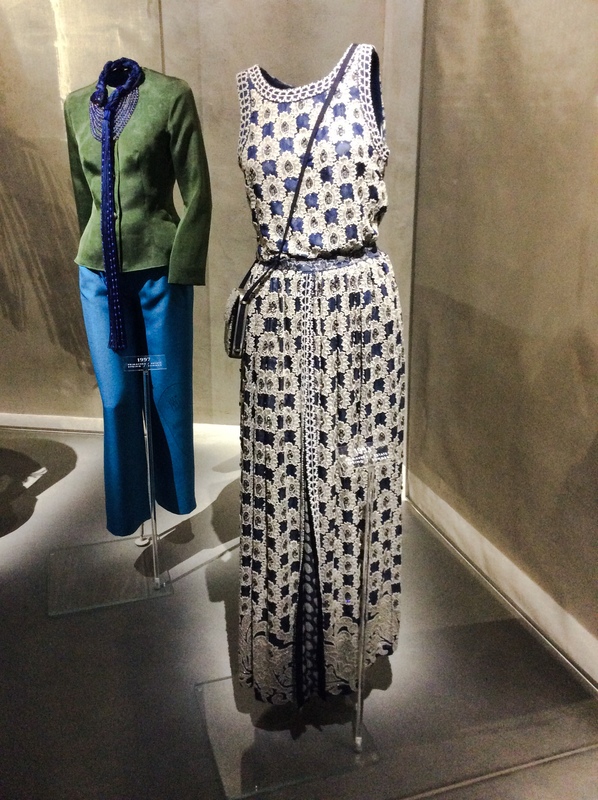 It was interesting to see how fabrics, cuts and styles have come back into fashion or been updated years later. 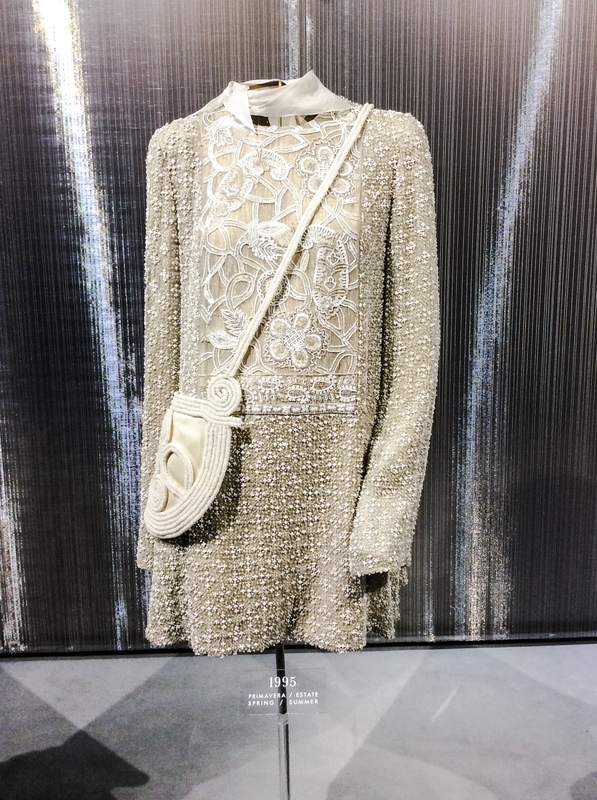 Armani is such an iconic brand and for me is the epitome of style! His designs are so perfectly cut and flattering to the body, minimalist and understated but so chic and elaborate at the same time. 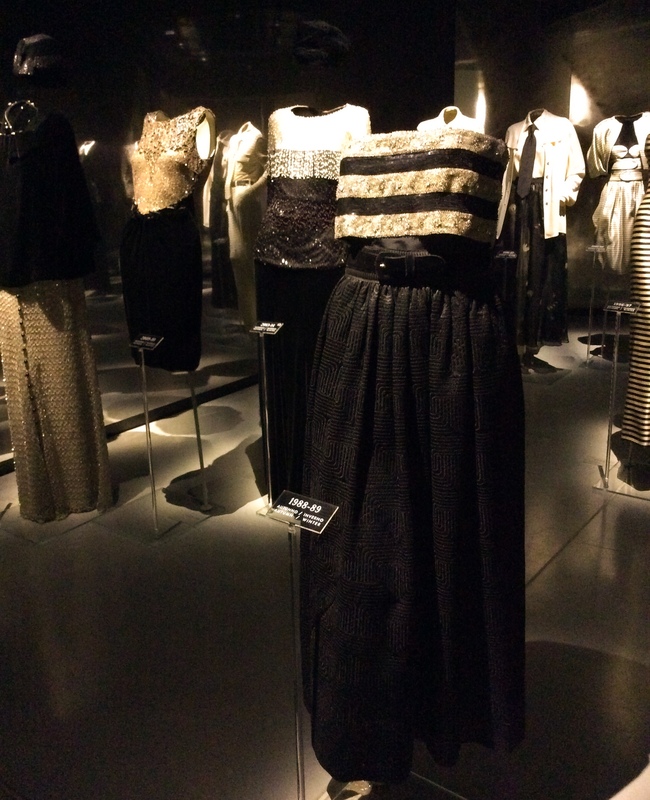 The Stars section of the exhibition featured a video showing the numerous famous faces who have worn Armani throughout its’ history, from Diane Keaton accepting her Oscar for Annie Hall, to Sophia Loren, Richard Gere and Lady Gaga. 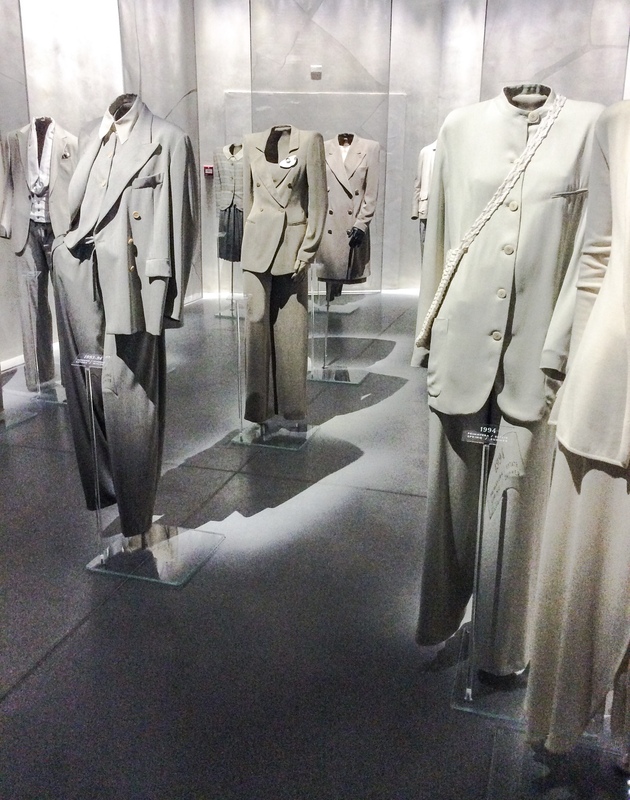 I have a somewhat special love for Armani, as whilst on my Erasmus year in Italy, I completed a six month internship at the company’s production offices in Modena. I was so excited when I was accepted and offered the opportunity, as I absolutely love fashion and it was an experience I will never forget. I learnt a lot and met some amazing people! (Sadly not the man himself!) 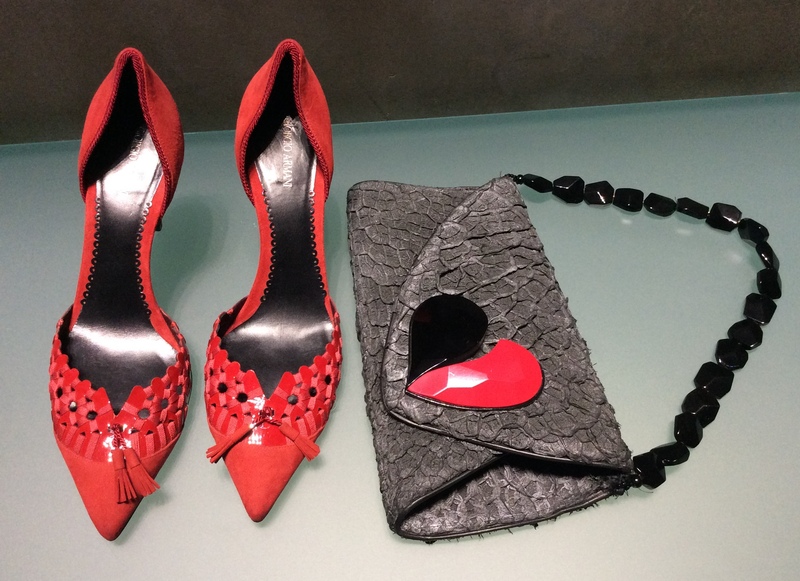 The main design offices for Armani are of course in Milan and the city is definitely his city! Not only is there the Armani department store, featuring all their lines, as well as a florists, but next door is the Armani hotel! Armani Caffe is a great place too for a light lunch or coffee and cake – they once had an amazing melting chocolate pudding! It was divine! And I have always found the staff in both the Caffe and Department store very friendly and helpful, so don’t be put off by the slightly intimidating style of the place! Love this dress! The colours are amazing, so vibrant and I love the delicate embroidery! Back to the exhibition and luckily for myself and the two friends I went with, Sunday seemed to be a particularly quiet day, so after clearing airport style security, we enjoyed the space almost entirely to ourselves! There were endless members of perfectly groomed and very good looking staff on hand to help…for example when all three of us could not work out how to call the lift…it was too high tech for us! Haha! 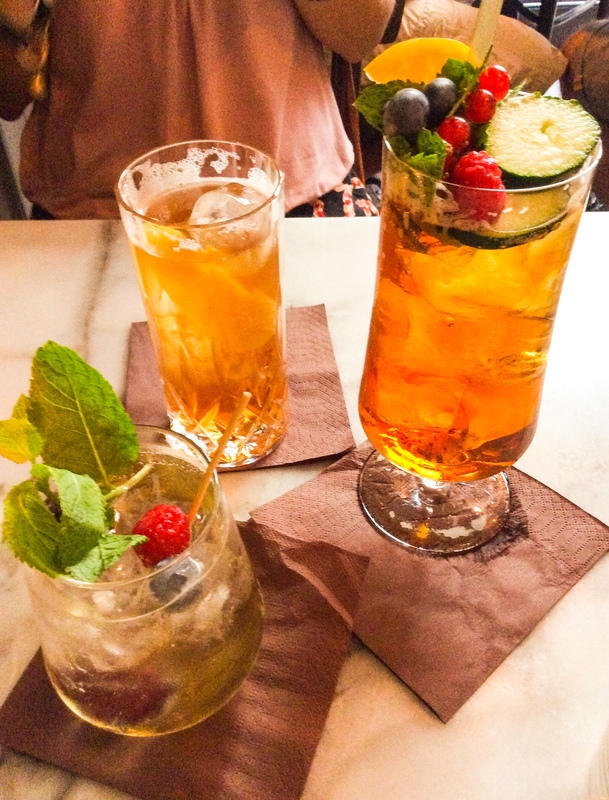 After we had spent a couple of hours exploring and appreciating all the beautiful clothes, we headed to the Navigli for a walk around the Darsena, before enjoying delicious cocktails at Ugo on Via Corsico. Another perfect day in the city!